9th March 2017 by Ara. Would you like to learn how to connect a CCTV system? Let us show you! Watch the video below where Matt, a member of the Satsecure team shows you how to connect a CCTV system and what you need. As you can see, connecting a CCTV system is easy. Keep reading below for a breakdown of what was covered in the video. There are 2 main types of cameras you can choose from, dome or bullet. The main difference between the two is the casing, and choosing one over the other is a matter of personal preference. If you'd like to know more details about camera lenses, IP ratings, and more, read our post: "5 Things You Need to Know About CCTV Cameras". • BNC ports: These represent the channels; if you have an 8 channel DVR, it'll support 8 cameras. • VGA and HDMI ports to connect to your TV or monitor, so you can adjust the recorder's settings and view recordings. • Audio inputs/outputs which allow you to connect a microphone to capture audio, and speakers to speak to people in their vicinity ("You kids get off my lawn!" as the American idiom goes). • Ethernet port to connect to your router, so that you can view your cameras through the app on your mobile device, or your computer. • USB ports: Very useful to connect a mouse and keyboard to have better control of your DVR. You can also download videos directly to a USB stick to hand over to the police in case of an incident. If you have between 1 to 4 cameras, a 12v 5 amp 4-way power supply will provide enough power. If you'd like to keep your connections and cables safe and tidy, you can opt for a lockable CCTV distributed power box. In the video, Matt used a pre-terminated video and power CCTV cable to connect his camera. There’s a reason for this: the length of cables required depend on the installation. In other words: the larger your property, the longer the cables you’ll need. 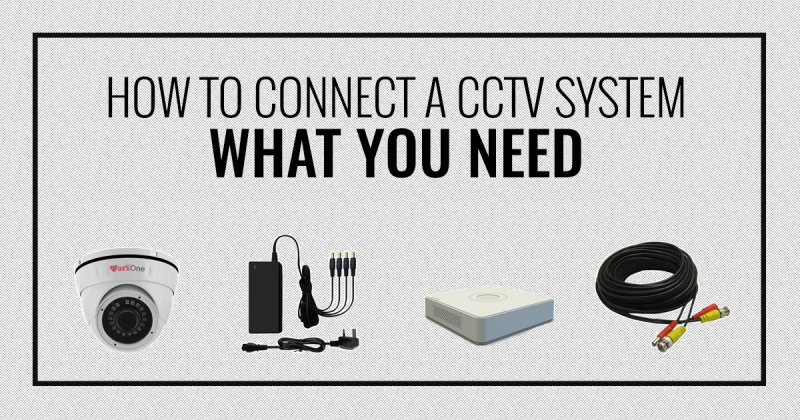 Now that we’ve gone through the steps of connecting a CCTV system, you’ll be able to do it yourself. We hope this has been helpful, and don’t forget you can always get in touch with us. Call us on 0161 4303849 and a friendly member of our team will help with your queries. This entry was posted in on 9th March 2017 by Ara.